I've upgraded from 9.3 to 9.4.0.5133, and after this update I don't see any objects in the db tree on the left. The schema's are there, and when I configure the tree to group objects by type, i do see the number of items, but I don't see the items themselves. In the screenshot you see how it looks. 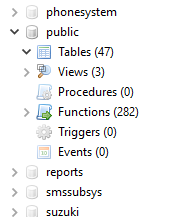 The schema's show, but the tables and other menu-items remain empty when you expand them. Note: this was working fine on this machine until I've upgraded HeidiSQL. This seems to be some filtering issue somehow. All objects show in the Database tab as they should. They just don't appear in the tree. When I tried to enter a filter I saw items appear, and using filter "*" (without the quotes), does what used to happen when there was no filter at all. I can work with that, but for other users this might not be obvious. Did the filtering change in the latest version or something? I also have this with PG. I created a new (empty) db and it doesn't appear in the tree, regardless of what's in the filters. I also recently updated. I didn't try PG before.